A completely unassuming strip mall in Rohnert Park right off Highway 101 might seem like an unusual place to find top-notch sushi, but locals and well-informed visitors alike swear by Hana as one of the best spots in all of northern California. I had been to Hana once before and enjoyed a fabulous dinner. Following the advice of a regular, this time we booked a seat at the sushi counter and let Chef Taka do all the rest. What followed was a seemingly endless succession of fabulous sashimi, sushi and hand rolls. 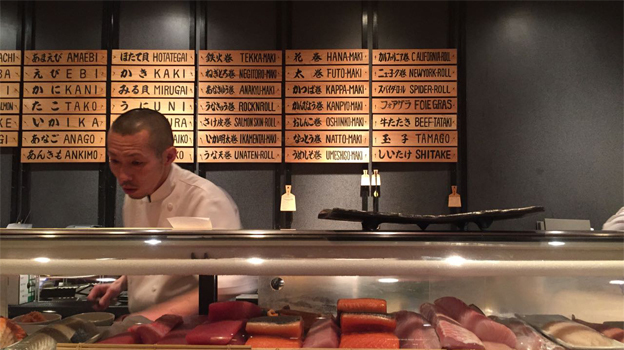 Eating at Chef Taka’s counter is more than a meal; it is culture and an education as well. Chef Taka presents every course with a brief explanation that highlights the unique qualities of each fish, where it is from, how it has been handled in the restaurant, and variety of other details that speak to an extraordinary dedication to the craft. It’s hardly a surprise that Hana is a regular stop for some of America’s most successful and well-known chefs. 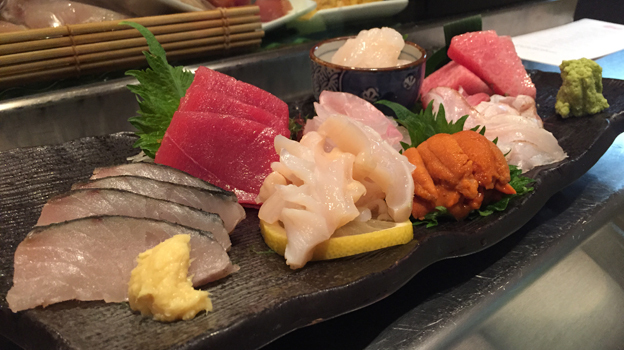 The sashimi platter alone is tremendous. The various fish taste like they were just plucked out of the ocean. I have too many favorites to single out highlights. A series of sushi follows, served as a series of small tastes, two to four pieces at a time. Chef Taka admonishes us rather sternly that we are not to add soy sauce to the sushi – he will do it for us, as each preparation warrants. I admire his passion and conviction. 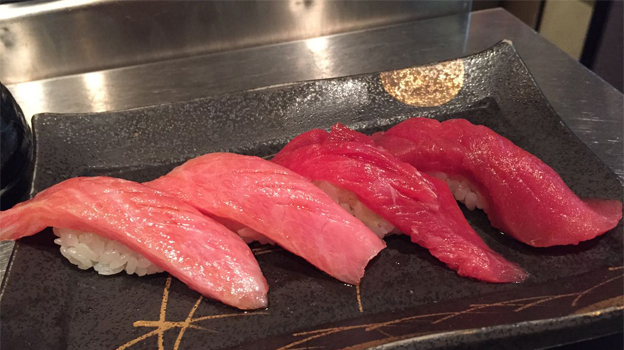 A platter of Japanese Bluefin tuna served four ways is the pinnacle of the evening. Tasty morsels from the back, cheek, center belly and collar are all sublime. Chef Taka explains that a 380 lb. tuna gives him just six portions of collar meat. A few hand rolls round out the dinner. Everything is utterly divine. In keeping with its unassuming neighborhood and location, Hana is quite informal. Don’t be fooled by appearances. The food is superb. Hana’s wine list is serviceable, but clearly not a focus. I prefer beer, especially after a long day of tastings, so that is not too much of an issue for me, but readers who want to drink something special should plan on bringing their own bottles. Dinner at Chef Taka’s counter is not inexpensive (our bill was about $400 for two), but it is worth every penny. Judging by the looks from other nearby seats and tables, I can only surmise quite a few guests would have also very much enjoyed the experience. Hana is convenient to Sonoma wine country, making it a great place to stop by after a day of tastings. The drive is about 15 minutes from Sebastopol, 25 minutes from Healdsburg and 40 minutes from the city of Sonoma. Readers spending time in and around Sonoma owe themselves at least one visit.